Last week was totally busy with festivals coming around first celebrated Teej and after that Rakshabandhan. Sewing the dresses and selling of leggings are demanded during festivities but my business is going on in slow motion. New updated post link of semi patiala salwar. Semi patiala salwar cutting video link. Anyways, lets come to our sewing journey today’s destination is Semi Patiala salwar. The draft is same that of salwar .In this type of salwar we add “Kali”to the salwar which gives more gatherings to salwar and enhances the look.In semi patiala salwar the gatherings are less compared to full patiala salwar and hence the flare is less. Fabric req.2.5 to 3 mts. 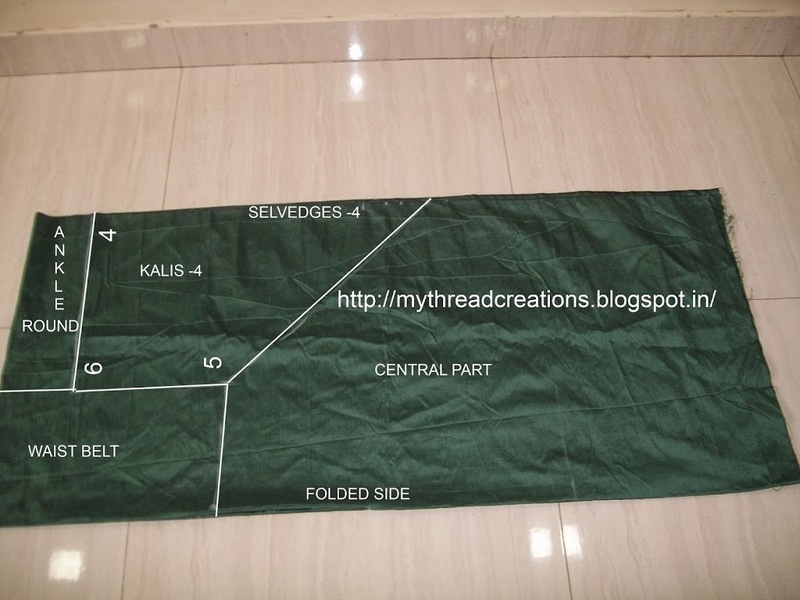 First cut the central part as shown below.Then cut the kali make sure while cutting on the fabric that the length of 4-5 of middle part and that of kali is same as they both will be joined while sewing. Updated snap on November 6. You have with you now 4 kalis and 2 central parts.Take one central part and stitch along the line 4-5 of kali with it.Stich in the same way another one also.Keep waist belt ready.Now attach the canvas part with ankle round.Sew both the leg parts.In patiala salwar we should take big pleats.After you finish pleating join waist belt and Voila!! salwar ready.The front view of salwar. The back view,see the fall of cloth,the curves. Good drafting. Clarity of picture may be improved. Whether the pleats need to be inwards or outwards . Should the pleats be put at the back or only in the front ? The pleats should be inwards only. And only in front. But can take couple of pleats in back. Will try to upload a clear picture. Good drafting. Clarity of picture may be improved. Pleats are not clear, whether they need to be inwards or outwards . Should the pleats be put at the back or only in the front ? Kindly clarify. Hi gurmeet, Wonderful tutorials. I am following it and picked up sewing simple kurtas for use. Do you have any tutorials on mandarin collars. Thanks Wlll much appreciate it. That means 4-6 of kali same as length of angle round. Am i correct? I think you should first draw and cut the draft on paper. So you will get clear idea about it. Hi Gurmeet, i try to stitch this salwar. But i have one doubt in that. How we mark 4-6. Can u explain this please. ( same doubt in full patiala also) Waiting for your reply. I have added an updated snap in the post which will clear your doubt very easily. Thanks for your immediate reply. Where is that updated post. In the above post I have added a new updated snap, I have written it in bold letters.